Virus is a nucleic acid, either DNA or RNA which is infectious in nature. Virus can infect all kind of organisms including plants, animals and bacteria. This nucleic strand of the DNA is called genome. Outside genome there is covering of proteinaceous coat called capsid. Outside the capsid there presents a fatty envelope. Capsid and genome together is known as nucleocapsid and all the three capsid, genome and envelope together is known as virion. Virus is an obligate parasite i.e. active only inside the host cells. Virus is also known as the connecting link between living and non-living organisms. a) Adsorption- This is the first step of DNA replication; virus comes in the contact of host cell and occupies the predefined receptors for attachment of the same. b) Penetration- After adsorption, Virus penetrates the host cell hence reaching inside the cell. c) Uncoating- Uncoating is the middle stage of the virus replication. Capsid of the virus is dissolved and genome id exposed to the host cell. d) Biosynthesis- After uncoating, next step is the biosynthesis. In this stage biosynthesis of nucleotides, proteins etc. occur. This is also called as the stage of dividing of virus. e) Maturation- In this stage, virus gets matured inside the host cell and ready to infect other cells. f) Release- This is the last stage of virus replication. All the new biosynthesized viruses are released from the host cell to infect other cells. a) Anti-herpes virus- Acyclovir, Gancyclovir, Idoxuridine & Foscarnent. Here I am discussing the individual mechanism of action of each class of antiviral drugs. All classes have their distinguished mechanisms to inhibit the viral growth. Thymidyl kinase of the host cell converts acylvovir into acyclovir guanosine monophosphate(GMP), which is further metabolized to acyclovirGTP by the host cells. This acyclovirGTP is responsible for inhibiting the DNA polymerase and hence inhibits the DNA replication of Viral DNA. There are two major respiratory tract viruses- Influenza virus A,B & C and respiratory syncital virus. 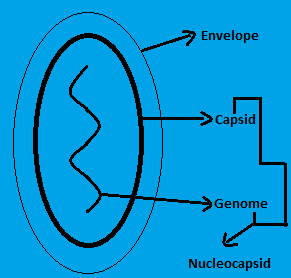 In normal cases, virion is engulfed by host cells and within the host cell the nucleocapsid is lodged into endosomes. Acid metabolites of the host cell help nucleocapsid to fuse with the endosome. This cause removal of the capsid and genome is released into host cell cytosol. Amantadine being weakly basic in nature neutralizes the acid metabolites hence results in no uncoating and no replication of the virus. Although amantadine is safe nature but can produce CNS symptoms. 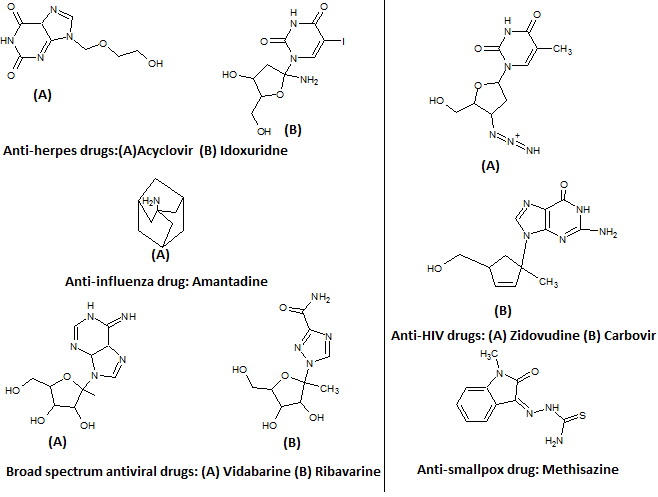 Broad spectrum anti-viral drugs are synthetic nucleosides. Generally, they combine with phosphate compounds and hence inhibiting DNA & RNA synthesis. AIDS was discovered in 1981 caused by HIV virus (retrovirus). HIV infects CD4 & T4 cells required for the cell mediated immunity which results in the death of CD4 & T4 cells. Cell mediated immunity collapse and ultimately results in death. 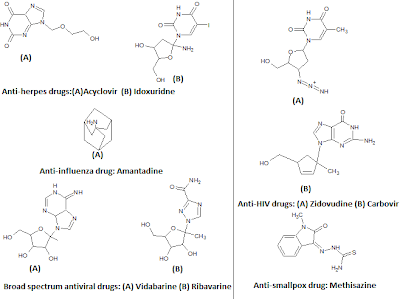 All drugs which act against HIV are Deoxynucleosides. First of all anti-HIV drug is converted to TTP derivative which after binding with the reverse transcriptase incorporated into the DNA chain of the virus. This prevents the replication and elongation of the chain. Anti-smallpox virus drugs act by inhibiting the protein synthesis in the biosynthesis stage of the virus replication. This ultimately results in the inhibition of the virus replication.